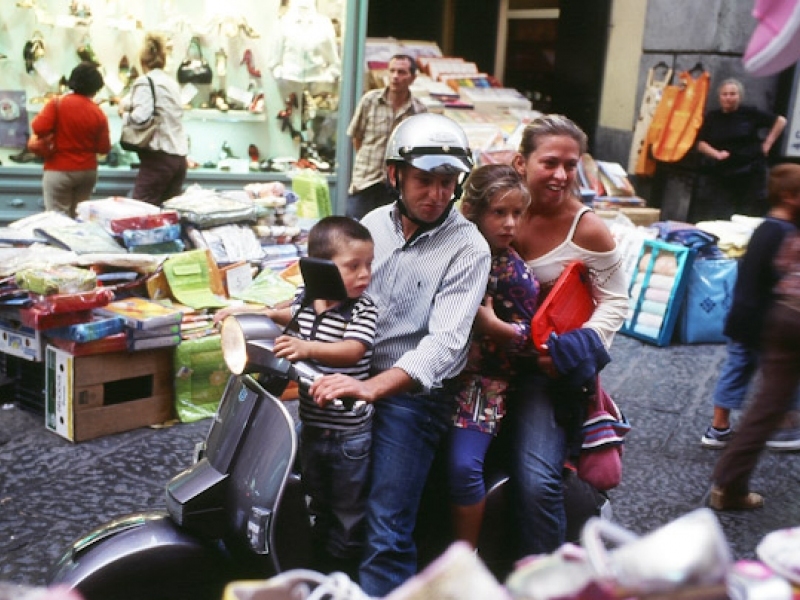 Scooters at dusk: fun for the whole family in Naples. 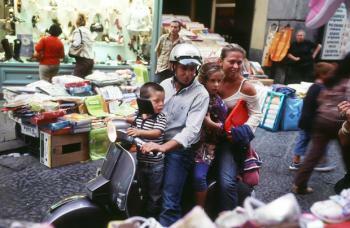 Every evening in Naples at dusk - which falls in late summer between 6pm and 7pm - is Vespa hour. Vespa, meaning the ubiquitous Italian motor scooter, invented after World War 2 as a means of cheap universal transport, widely imitated, and still going strong 60 years later. Whole families - Dad, Mum, and one or two kids, some barely more than babies - squeeze onto a scooter and tear at speed through the narrow cobbled streets of “Spaccanapoli”, or old Naples. The youngest child we saw actually had a sucker in its mouth. Helmets are strictly optional. 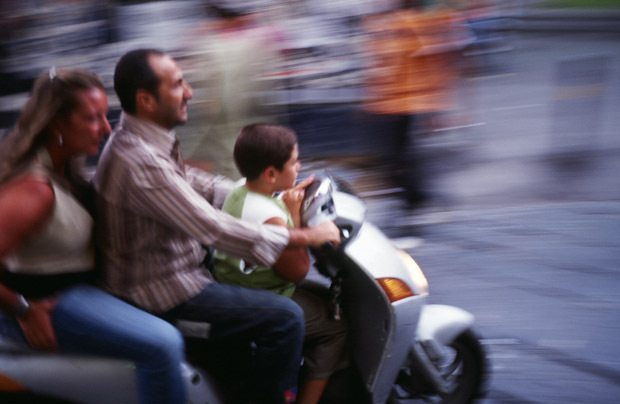 As many of the scooters are two-stroke models, fumes fill the air and they make quite a racket. Unlike Christchurch’s “boy racers”, however, these scooteristas are not threatening. They are just out for a fun time – they are families, after all. I have a Vespa myself (a 150cc four-stroke), and wouldn’t have minded zipping through the streets as well. Nowhere did we feel unsafe. Most tourists keep away from the narrow streets that climb northwards from the city centre, but we found them great to explore – and we also found some clothing bargains in the night market. In fact, crossing the street in Naples actually feels safer than it does in Christchurch. They have real crossings, not “pedestrian refuges”. Just step out and cars stop for you. But over the last year, a most unwelcome problem has gripped the city: rubbish. Because of conflict between the Camorra, the local mafia, and the authorities, piles of rotting rubbish have been left piling up in the streets. Prime Minister Silvio Berlusconi, the army, and even the EU have become involved. Prospective tourists have voiced their concern on Internet forums. At the time of writing, it’s unclear whether the rubbish mountains have now been completely cleared – it would pay to check before going. Naples boasts magnificent churches – seemingly every other building in the old town. There are also lots of antique shops. Historic prints are interesting, and packable. The splendid Archaeological Museum is packed with art and Roman artifacts, many of them uncovered from the ruins of Pompeii and Herculaneum, destroyed by the eruption of Mount Vesuvius in AD79. 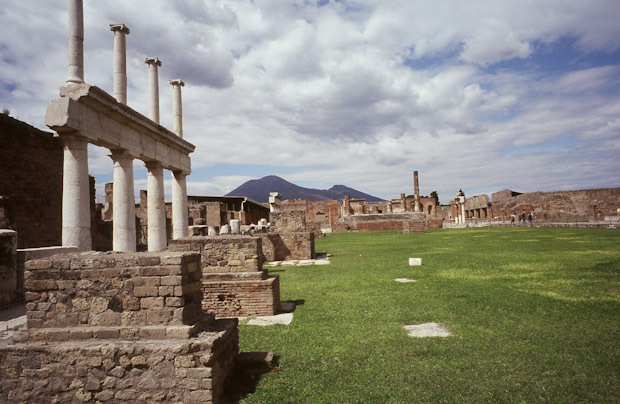 The still smoldering mound of the volcano broods over the bay, and for an evocative day trip, Pompeii is a short train ride away. You can marvel at the original graffiti, step inside old villas and see paintings and unworn marble kitchen benchtops, visit the famous House of the Fawn and the brothel with its explicit drawings, and gaze at the pitiful plaster casts of corpses, frozen in their dying moments postures when the eruption overtook them. Another day trip takes you by boat to Sorrento. It’s a charming clifftop town, but sadly it’s totally overrun by English package tourists. Their experience of authentic Italian life entails block booking the hotels, eating the same food, and paying 10 euros for the privilege of a tiny space on a rocky beach. Incredible! We could have hired a scooter for a road trip south along the Amalfi coast, but ran out of time. Eating is easy. Supermarkets abound but are well hidden. Just follow the shopping bag-laden locals. Wine and cheese are cheap. Pizzerias sell the real thing: Naples is where it was invented. Pizza Margherita was made in 1889 to honour the queen, its basil, mozzarella, and tomato toppings imitating the green, white and red of the Italian flag. Cake and pastry shops are irresistible. We got hold of some pizza and cake and lugged them back to our hotel roof deck. We washed them down with a bottle of Lacrimi Christi, “Christ’s Tears”, a white wine from the slopes of Mount Vesuvius. More touristy restaurants are some way away from Old Naples. Unfortunately, Italian prices have rocketed ever since the introduction of the euro, even in the south; hotels such as the Costantinopoli 123 (check name), where we stayed, will set the traveller back as much as 220 euros a night (the most we paid on our European trip.) But comfort, safety and security, a pool, roof deck, tasteful décor and a decent breakfast were worth paying for. Naples is easily reached in about two hours by train from Rome.